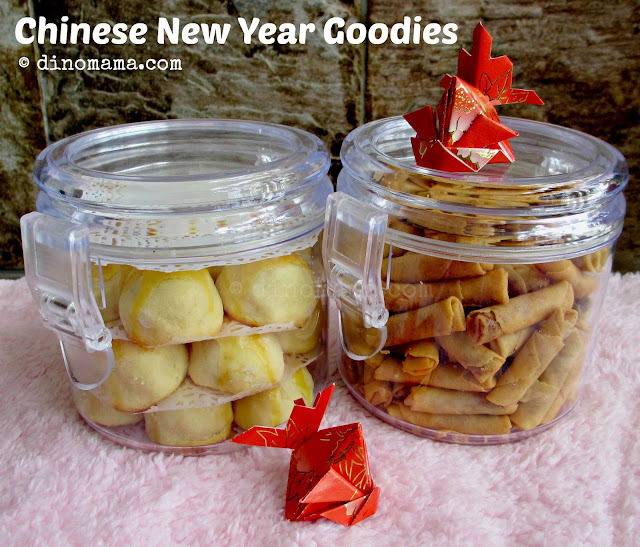 This year, not only the Chinese New Year came earlier that usual, but there is a new kid on the block to woo and wow our taste buds with their savory snacks. 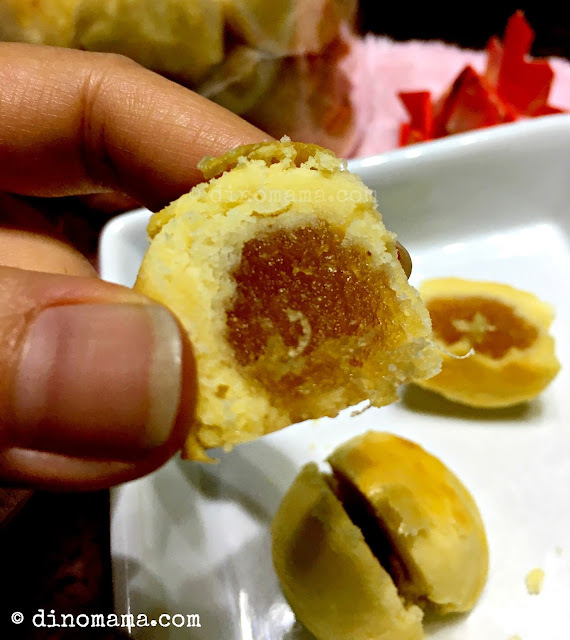 This new kid; Pineapple Tarts Singapore, started off as a humble bakery in Penang selling their homemade pineapple tarts which soon became a top favorite among the folks there. With a total of 47 outlets all over Malaysia, this new kid decided to cross the sea to venture into our island. Customers will always be our first priority, as long as you are happy, we are happy. It will be our goal to attend to every customers' needs to the best of our capabilities. We are lucky to be among the first few who have a chance to taste their pineapple tarts and spicy prawn rolls. There are 2 types of pineapple tarts available at Pineapple Tarts Singapore, the traditional Melt In Your Mouth (Retailing at SGD19.90 per tub) and Cheezylicious (Retailing at SGD22.90 per tub). We first tried the traditional pineapple tarts as cheese has a stronger taste so it may affect our taste bud which may not allow us to taste the true flavour of the other type. When I bite into the pineapple tart I immediately went "mmm~ not bad!" True to the description on their website, the pastry is soft and buttery but it is not crumbly. As you can see from the photo below, I used a knife to cut the tart into half, the pastry still hold it shapes though there were some that breaks off but that is minimum. 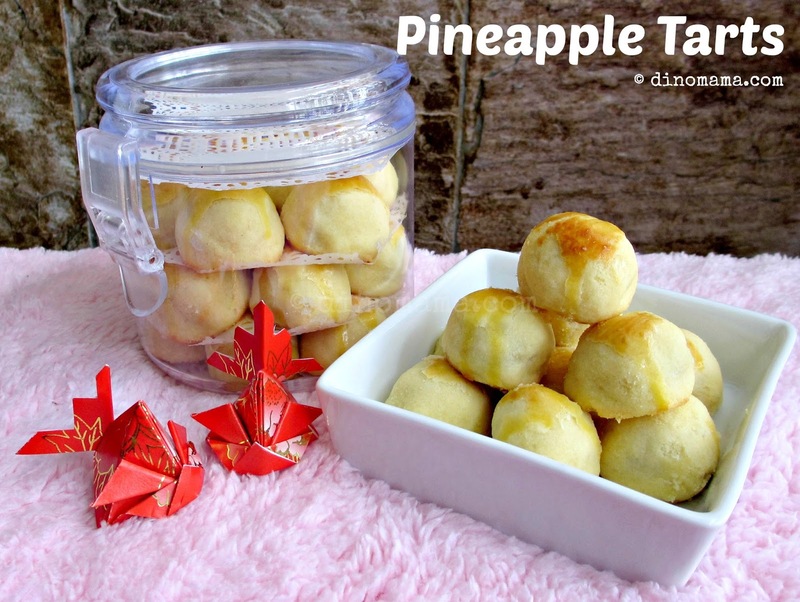 How we hate to sink our teeth into gummy, sticky pineapple fillings! It's worse when there are fibers as thick as rope or it's so sweet that you either have a headache or have sugar rush for hours or so sour that you just can't stomach it (Ok I am exaggerating but you get the idea.). The pineapple fillings for these tarts are of the right blend of sweetness & sourness, the texture is soft with tiny pineapple fibers. Pop the whole tart in your mouth, the proportion of the buttery taste of the pastry and the acidity of the filling comes together to balance out the overall taste nicely. When I opened the tub of Cheezlicious tarts a strong cheese smell rushed towards me, Woah~ that got my taste bud excited. These tarts are made with the same fresh ingredients as the traditional pineapple tarts, except that the pastry is infused with Parmesan cheese. After tasting it, we feel that even though there was a strong cheese smell, the cheese taste was not prominent but we could taste the saltiness from it. I think they reduce the salt in the pineapple filling for this (maybe I am wrong) because even though there were the saltiness from the cheese, it did not compromise the overall taste of the tart, instead it blends in well and taste almost perfect. 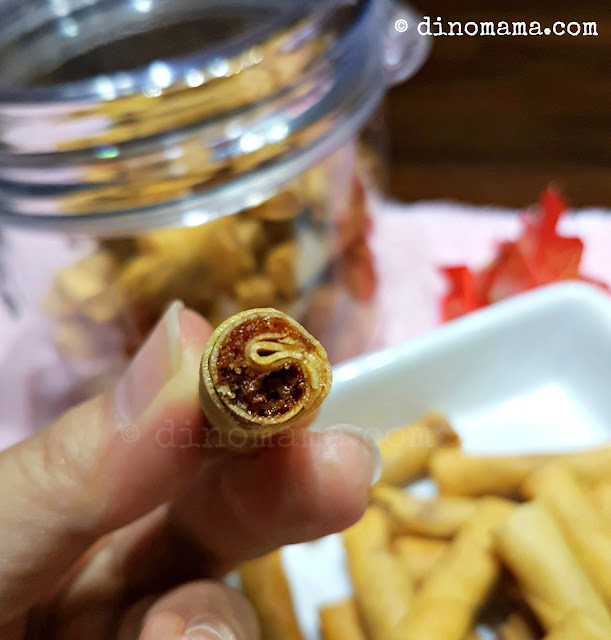 A long time ago, when I was a little girl I used to love these savour nibbles and will keep on munching them non stop at every Chinese New Year. They were so crunchy, full of sambal fragrant at every crunch that I simply can't stop eating them! One year I had way too much of it and ended up with a very bad sore throat that caused me to lose my voice too. I was very miserable, took me a few weeks to recover and after that I kept away from the prawn rolls for many years. When I gathered much courage to sink my teeth into these rolls again few years ago I was disappointed. Gone are the crunchiness and the shrimp sambal shiokness. What I tasted was overwhelmed oiliness and sometimes burnt sambal filling. 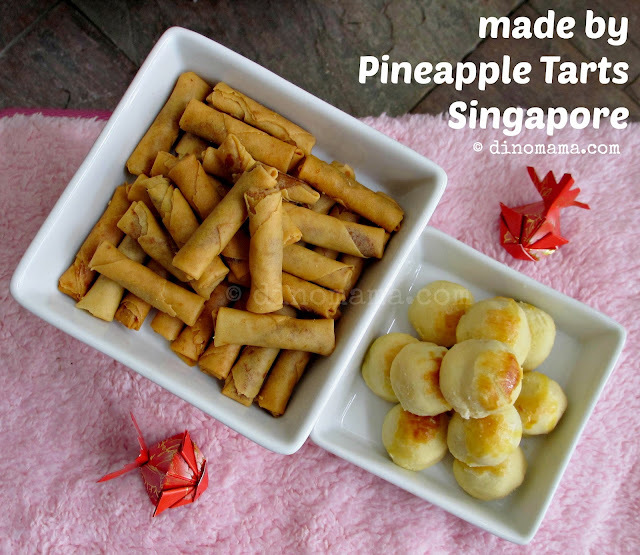 I fell in love with Pineapple Tarts Singapore's Crispy Sia or Nyonya Prawn Rolls (Retailing at SGD12.90 per tub) after tasting the 1st piece, I probably found my favourite store-bought spicy prawn rolls as they tasted like those. As you can see from the photo below they are not stingy on the shrimp sambal filling too. 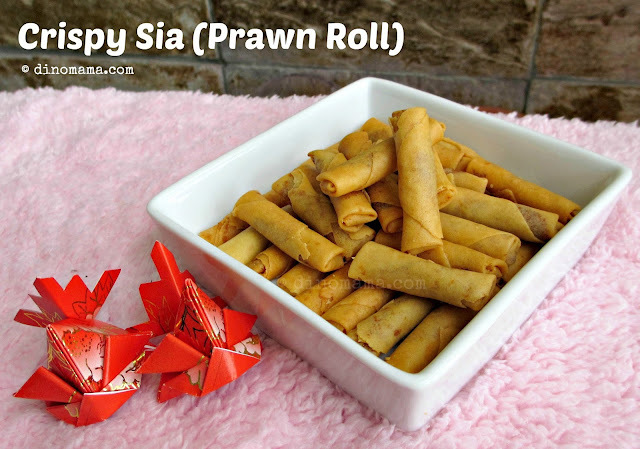 Instead of just slapping some filling in the middle and roll it up like what you see in most of the spicy prawn rolls found in the market, they apparently cover the whole spring roll skin with it and roll it up. Every bite is with spicy shrimp sambal filling and crunchy skin, YUM! We never really fancy store bought cookies as they do not taste as nice as before, plus they are machine made and price are not justifiable for the quantity sold. If we do buy them it is because we are having friends over during the festive period and gotta have some to entertain them. This also mean that we have a yardstick to compare Pineapple Tarts Singapore's pineapple tart with. 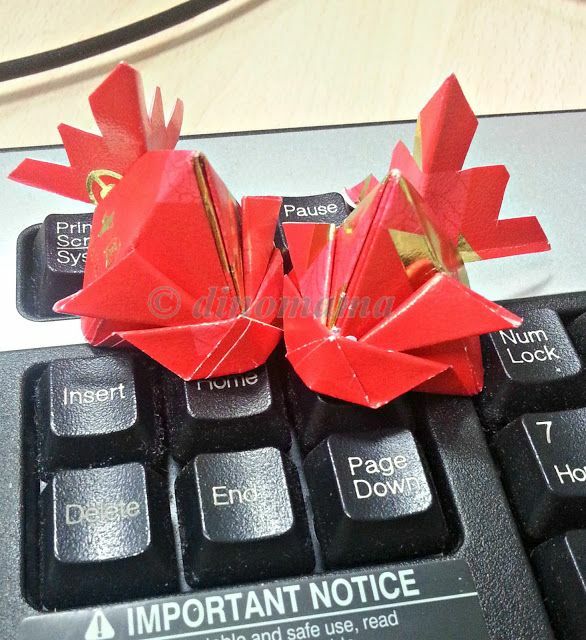 Plus the Spicy Prawn Rolls is DinoPapa's favourite and he have not been able to find one that is up to his standard. So this food tasting was not an easy one. We took time to savour each pieces of snacks and found only minimal things that we do not like. The pineapple tarts are as good as the ones that we made it ourselves, which is as close as home made snacks we can get from store. The spicy prawn rolls are shiokingly good, spicky and crunchy, can't stop at one or ten! The prices of the snacks is reasonable too; about 20 pieces of pineapple tarts and a tubful of prawn rolls about half my finger length, which I would gladly part my money with in exchange for such great delicious snacks. We always share things when they are really good so here is a promo code if you want to buy from Pineapple Tarts Singapore. Still unsure after reading my review? (How could you! lol) Well, you can go to their shop for tasting or sampling of their snacks at their warehouse. 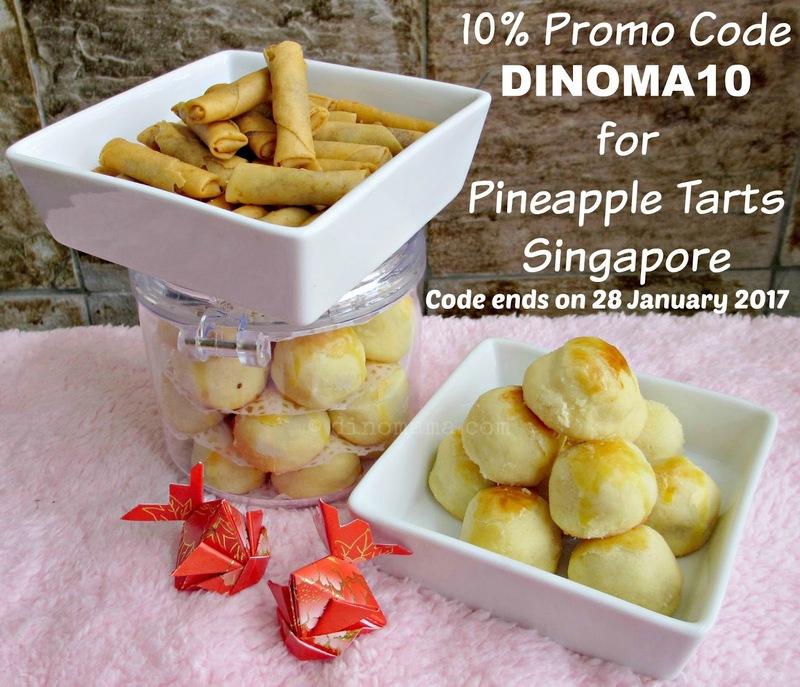 You just have to email them at pineappletartssg@gmail.com to make an appointment before coming down to sample their snacks. Disclaimer : We received tubs of pineapple tarts and spicy prawn rolls from Pineapple Tarts Singapore for the purpose of this post. No other compensation was received. All opinion in this post are 100% ours and based on our tasting of their products. All photos in this post belongs to The DinoFamily, you may not use them without seeking our permission. Lastly, if the 2 cute little red pack fish caught your eye too, you can learn how to make them too! Click on the link CNY Craft - Red Packet Fish. Thanks for the promo code. I placed the order with the code!